Five JROTC Scholarship awards of $1,000 were presented this year during the Chapter luncheon at McCormick Ranch Golf Course on 21 May 2011. TriWest Healthcare Alliance donated $2,000 to the scholarship fund. 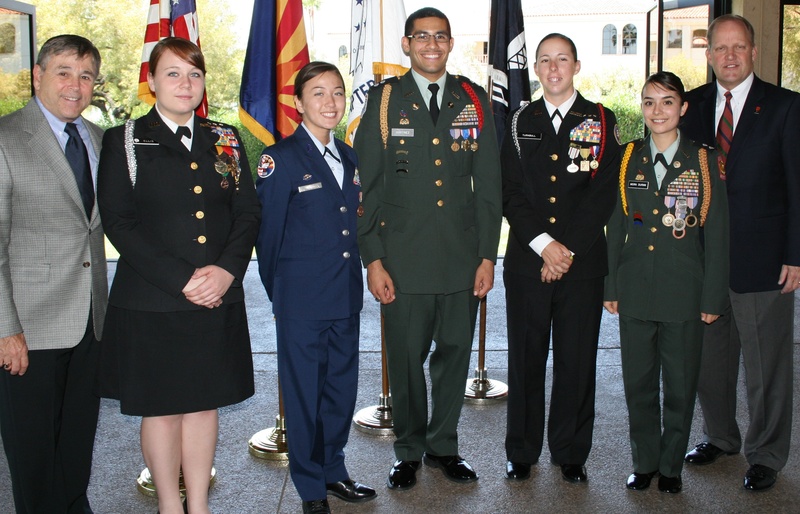 Left to right: Colonel John Ady, Arizona Chapter MOAA President; Navy Cadet Jennifer M. Ellis, Moon Valley HS; Air Force Cadet Lyna Ngo, Sandra Day O’Connor HS, Army Cadet Jaime Martinez, Jr., North HS; Navy Cadet Genevia MacFarlane Turnbull, Cortez HS; Army Cadet Carolina G. Mora, Alhambra HS; and Mr. Biff Messinger, TriWest Healthcare Alliance Director of System Operations.